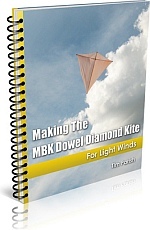 An MBK Diamond kite of every type, featured in Flight Reports. The largest MBK Diamond kite needs to have the vertical spar slipped into place and secured before flying. The smaller Skewer designs are ready to go, with no setup at all. Apart from attaching the flying line of course. 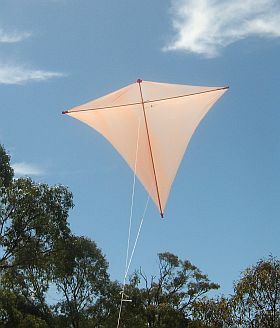 This classic class of kite can be a touch tricky to hand launch since it is not fully stable until the tail is floating free of the ground. But once up, they are good reliable fliers. The Dowel Diamond is a variation that does not require a tail, so it's a bit easier to launch. With the power out for a few hours, it seemed a good idea to walk down to the local reserve with Aren. Not without a kite of course! There was just over an hour of sunlight left in the day and leaves were barely moving. But that's just how the Dowel Diamond kite likes it. It turned out to be quite an interesting outing with the pale orange Eddy-inspired MBK Diamond kite. A few tows were necessary to contact perhaps the 3kph necessary to stay up there. Very marginal indeed, with the kite sometimes losing height on its face or in the gentlest possible tail-slides, before edging upwards again. Holding altitude at around 150 feet, but pulling so lightly that the 25cm (10 inch) wooden winder could just be left on the grass! Later, I put the kite bag on it, just in case. I could have used the 20 pound line, rather than the 50 pound it was on. Flying face-down in the weakest of thermal air, holding height with the flying line draped almost vertically down to where several meters of it just lay in the grass! Took my eyes off it for half a minute or so while winding it back in. At a very high line angle, it managed to get itself into a vertical dive before I noticed. The Diamond just curved round in a large languid loop before righting itself, well above the tree tops. Whew. With the line length back to around 10 meters (30 feet), I had fun dancing the kite just out of reach of Aren. He tried pelting it with a bark chip, and eventually succeeded in getting the chip stuck in the bottom corner pocket of the sail. Not once, but twice. Checked the wind meter after half an hour or so of flying. Peak gust strength of 4.1kph (batten down the hatches) and average wind speed of ... 0.0 no mistake, 0.0kph! Most of the time the cups weren't moving at all. This was near ground level of course, but I think that 0.0 reading is a first. If you are in the habit of checking the 'what's new!' link, you might remember some of these.